2004: The building was purchased in February by a Long Island, NY developer for $2.5 million. The building is to be converted into apartments, with retail space on the first floor and offices on the mezzanine and second stories. The Broad Street Bank Building is the only example of an early twentieth-century skyscraper in Trenton. It was built in three phases. An eight-story structure in the Classical Revival style, built in 1900, was followed in 1913 by a twelve-story addition, and by another 8-story addition in 1923. The additions use architectural details from the original structure so the entire building appears as one cohesive design. The building includes a number of city milestones. Besides being the first skyscraper in Trenton, it had the first steel superstructure (built of I beams invented in Trenton), the first elevator, and the first revolving doors. It stands today as an important reminder of Trenton’s prosperity in the first half of the twentieth century. But it may not be there much longer. The building has deteriorated so badly in the decade it has been vacant, that it is now a safety hazard. 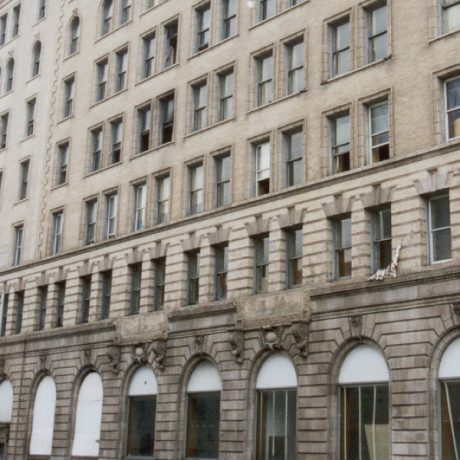 While the city’s master plan calls for the revitalization of the bank’s downtown neighborhood, nothing has come of various reuse plans for the building. It is now a candidate for demolition. But redevelopment should be consistent with preservation. The city’s first skyscraper can and should be the cornerstone of new vitality, not a ghost of previous prosperity. The Bank celebrates its 105th birthday in 2004. The Trenton Preservation Committee is actively lobbying the City of Trenton to consider options for preserving this landmark through writing letters of support and meeting with officials.